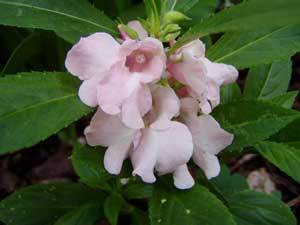 This is Impatiens balsamina, also known as Balsam, Garden Balsam, Garden Jewelweed, Rose Balsam, Dopati, Gauri Shankar, and Touch-Me-Not. The seeds were collected from a mix of several different colors. Some of the plants were variegated and others were not. 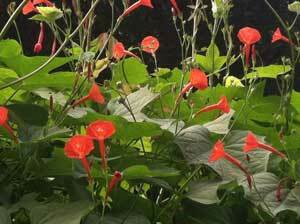 This is an Annual plant that likes to live in the sun but can also be happy in partial shade. 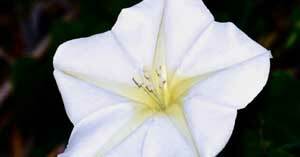 It blooms from late Spring until early Fall and is a very popular guy with the bees, birds, and butterflies. This plant has a high mineral content when it is raw, so you do not want to eat too much of this plant while it is raw but it can be boiled or dried and eaten without a worry. 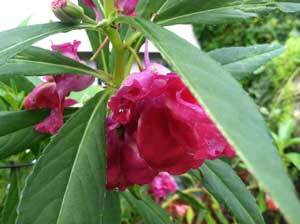 People with gout, hyperacidity, kidney stones, rheumatism, and arthritis should not eat this plant. Touch-Me-Nots are a known nectar source for the Tailed Sulphur, Victorine Swallowtail, and Rusty-tipped Page butterflies. It is also a nectar source for the White-striped Black moth. 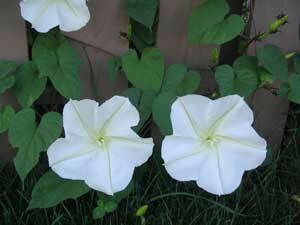 This is Ipomoea alba, also known as Tropical White morning glory, moonflower, Giant White , and moon vine. This amazing tropical vine is very fragrant and quite beautiful. 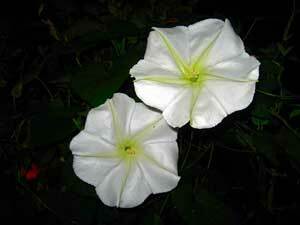 The flowers open quickly in the evening and stay open until they are touched by the morning sun. 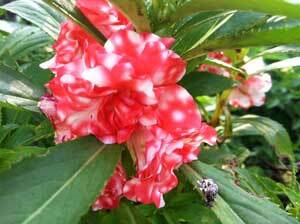 This plant must live in full sun and blooms from late Spring until early Winter. 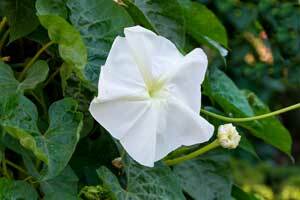 Ipomoea alba is the plant for bringing the Morning-glory Prominent, and Morning-glory Plume, and Morning-glory Leafminer Moths, and it also lures the Mexican Fritillary, and Spicebush Swallowtail butterflies into your garden. 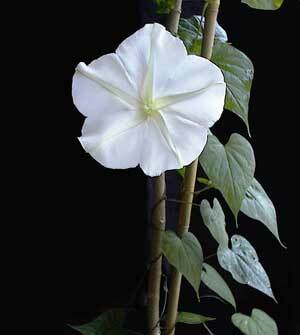 This plant is a larval host for the Morning Glory Pellicia, Mimic butterflies and the Pink-spotted hawkmoth. It is a nectar source for the Sheep Skipper, Purplish-black Skipper, and Cloudless Sulphur butterflies. The seeds and leaves can both be eaten and are best when picked while they are still young. They can be eaten as a vegetable or be used in soups, stews, and curries. The leaves can also be dried out and saved to use later. 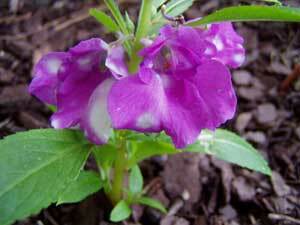 This Plant grows anywhere as an annual, and it is a tender perennial in USDA Hardiness Zones 8 to 11. 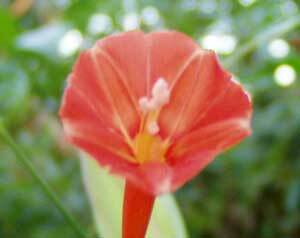 This is Ipomoea coccinea Orange Noah, also known as Scarlet Star Glory. This cultivar has redish orange flowers with orange centers. 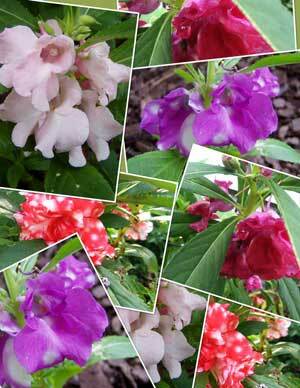 This is one of the best plants to have if you want to lure hummingbirds into your garden. It is an aggressive plant but you can easily pull it up where you do not want it. It is worth the little bit of work that it creates just because of the wildlife that it brings. Orange Noah can get 12 feet long and likes to live in full sun where it will bloom repeatedly from the middle of the Summer until early Fall. 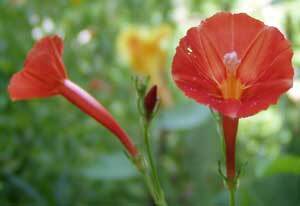 Ipomoea coccinea Orange Noah is the plant for bringing the Morning-glory Prominent, and Morning-glory Plume, and Morning-glory Leafminer Moths, and it also lures the Mexican Fritillary, and Spicebush Swallowtail butterflies into your garden. 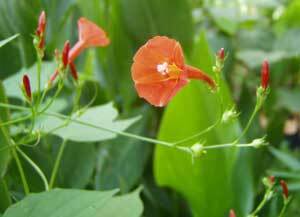 This plant is a larval host for the Morning Glory Pellicia, Mimic butterflies and the Pink-spotted hawkmoth. It is a nectar source for the Sheep Skipper, Purplish-black Skipper, and Cloudless Sulphur butterflies. 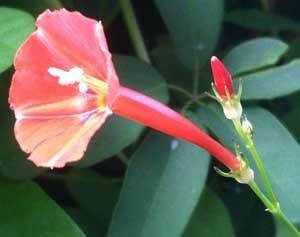 Ipomoea coccinea Orange Noah is an annual vine, therefore it can be grown in any USDA Hardiness Zone.